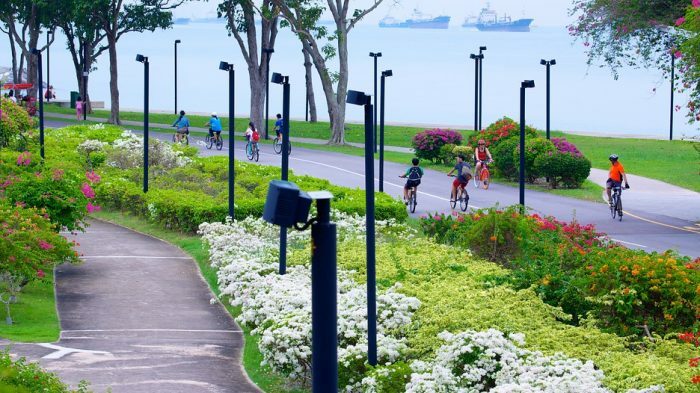 East Coast Park is one of the most popular places for running and biking in Singapore. A paved, flat path runs 6+ miles from the Marina Bay area near downtown, heading east toward the airport, paralleling the East Coast Parkway. There are water views and lush greenery the entire way. Sections pass along a public beach. This is not a remote park. It can crowded. The route option is pretty straightforward. The path runs along the park, nearly 6 miles. One can continue eastward along the Changi Coast Walk path, for another mile or so. There are numerous recreational activities in the park. Much of the path is lit at night. East Coast Park is also home to Parkrun, a free group 5k held every Saturday morning. You can see the course map and learn more here.